Om Villa has pretty-as-a-postcard sea views, a solar-heated pool, and a home theater. It offers five bedrooms for groups of up to 11 guests, so everyone has plenty of space. You can see Marigot Bay and Tortue Island from the terrace, bedrooms, and living area. You can unwind in the home gym, or do some yoga on the expansive terrace. The impressive gourmet kitchen has an espresso machine and wine cellar, on top of modern appliances that will impress any chef. If you want privacy and luxury amenities for your next couples’ vacation, you’ll love Om Villa. Terrace views from every angle! 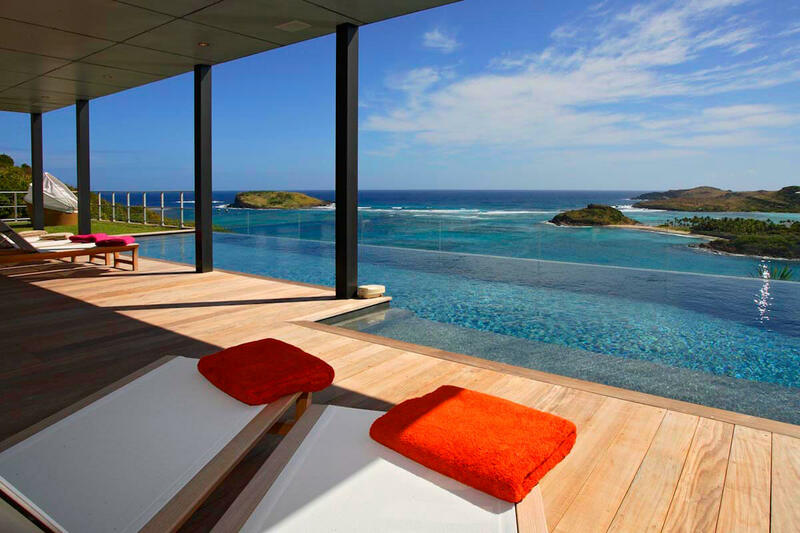 Villa Om is part of Mont Jean, a private gated community on the north side of St. Barts. This fully air-conditioned villa has panoramic views and commissioned artwork from local artists throughout the home. A grass courtyard surrounds the terrace, perfect for picnics. The large infinity pool runs along the edge of the terrace and seems to overflow into the sea. The pool is solar-heated, and a glass barrier protects swimmers from the wind. Daybeds and loungers are placed throughout the terrace for guests to read, recline, and relax on. Guests can workout in the gym, then cool off with a dip in the pool. A BBQ grill and outdoor dining table enables guests to feast with an ocean view. The large living room mirrors the exterior living and dining area, with sliding glass doors that open to the terrace, pool, and ocean view. A flat screen TV, couches and armchairs, and dining table for 10 fill the space. The modern kitchen is located next to the dining area, and comes fully equipped with stainless steel appliances, an espresso machine, and wine cellar. The villa has two spacious master suites and three guest bedrooms. One of the master suites is adjacent to the living room, with a king-sized bed, ensuite bath, and satellite TV. The other master suite is located in a separate cottage, with equal amenities. This cottage suite is perfect for parents or grandparents who want a calm space away from the main villa. The other three bedrooms are in the center of the villa, both with European king-sized beds, ensuite bathrooms, TVs, DVD players, and terrace access. Every bedroom offers views. The media room can double as a sixth bedroom, comfortably furnished with sofas that convert into three twin beds. It has a home cinema with surround-sound and an ensuite bathroom. Om Villa is just 5 minutes from Lorient Beach’s reef-protected waters, ideal for swimming and snorkeling. Gustavia is a 15 minute drive away, popular for its spas, dining, and shopping.